Marlie and Me: Growing Tree Toys Wish List Giveaway! With Christmas around the corner I have been thinking about creating a wish list of toys and games for Marlie, sort of like a list for Santa except it will go out to family and close friends so I can avoid making trips to retailers in the post-holiday madness to return gifts that I don't approve of. 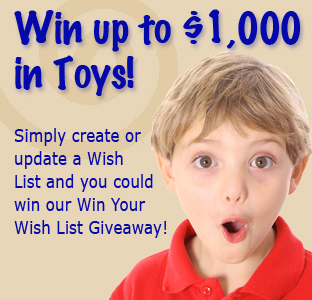 Growing Tree Toys has a handy wish list tool and they've just announced a sweepstakes prize of an entire Wish List to a single winner! To enter, simply create a Wish List anytime before October 31st, 2010 and add all your favorite toys to become eligible to win. At the end of October, Growing Tree Toys will pick a random winner from all of the Wish Lists, and that person will win all the toys on their Wish List (up to $1,000)! I've already created a wish list for Marlie with these favorites: Wheely Bug Ride On Toy, Ducky Baby Spring Float with Canopy. What wish list would be complete without a Radio Flyer Ultimate Classic Wagon! So, what are you waiting for?! Go create your Wish List today...don't delay the entry deadline is October 31st!